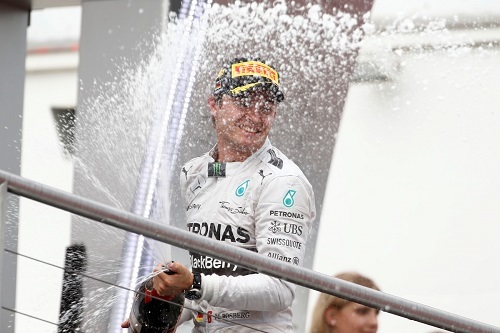 Now that was fun F1! As a rule, I dislike the layout of Hockenheim, but there is no denying that it always throws up a good race, and yesterday was no exception! Fist corner incidents, upside-down cars, cars on fire, unexplained donuts and of course some amazing wheel-to-wheel racing. I want to do it all over again! For the past few weeks I have been feeling a little jaded with the sport. Qualifying always seems to throw up the same results, and the race inevitably ends with a Mercedes 1-2. This weekend was no exception (well it was a Mercedes 1-3, but that’s besides the point), but somehow it felt different. The stewards have calmed down on imposing overly harsh punishments for racing incidents, and as a result we saw much closer racing and more daring maneuvers, the kind we expect from Formula One drivers. The banning of FRIC (what the fric is FRIC anyways) also improved the quality of racing as drivers worked to control their cars, especially into the tighter corners. So, to the race. The first corner saw plenty of action as per usual, with an unnecessarily frightening and somewhat uncomfortable to watch accident involving Felipe Massa and Kevin Magnusson (I have often wondered to myself whether Felipe’s wife berates him after accidents like that and threatens to stop him racing – I know I would if I was his wife), where luckily Felipe walked away unharmed despite flipping his car. Due to this accident, Ricciardo was forced out to get out of harm’s way, leaving the space clear for Alonso and Vettel to sneak into third and fourth. Had this accident not happened, we might have had a different final outcome. Nico Rosberg was, as normal, untouched at the front (Somebody, anybody catch the Merc’s please!). He streaked away and left the others to do battle behind him, coming home at the front for his fourth win. And do battle they did. 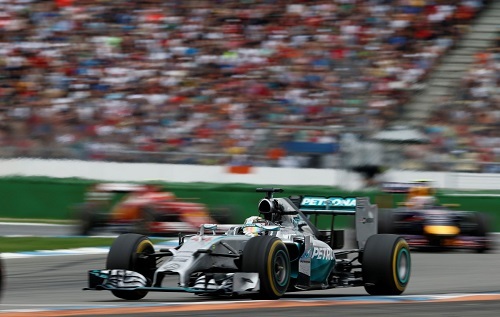 Hamilton had an incredible day at the races, coming from 20th place to 3rd, narrowly avoiding three collisions with other drivers, and overtaking in some spectacular ways. The other star of the day was Valterri Bottas who made good on the promise that the Williams showed, and finished in second, splitting the Merc’s. Fernando Alonso spent the majority of his day battling Red Bulls, firstly in the form of Sebastian Vettel, and then in the form of Daniel Ricciardo. A last minute switch to a three-stop strategy for the Ferrari allowed him to overtake Ricciardo in the dying moments of the race, and come home in fifth behind Vettel. Ricciardo is continuing to impress me this season with his consistency speed, and style of driving. Very few drivers would have adapted that well to being in the shadow of a four-time World Champion in an impressive car, and still manage to come out on top. Nico Hulkenberg, who has quietly maintained a 100% points-scoring record this season, finished in the points again, managing to avoid a lot of the chaos that was going on in front and behind him. He finished ahead of both McLarens and his teammate. Raikkonen finished outside of the points again, struggling to get his car through traffic and just generally not driving how he is capable. Obviously he has not been able to find a comfortable balance in the Ferrari and it is really beginning to be detrimental to both him and the team. The Torro Rosso of Kvyat provided some frightening moments as well as it set itself on fire near the end of the race. Luckily just the car was damaged, and Kvyat got away unharmed. Adrian Sutil also spun his car for no apparent reason, leaving it stranded in the middle of the track, and causing marshals to run out on to the track to move the car. 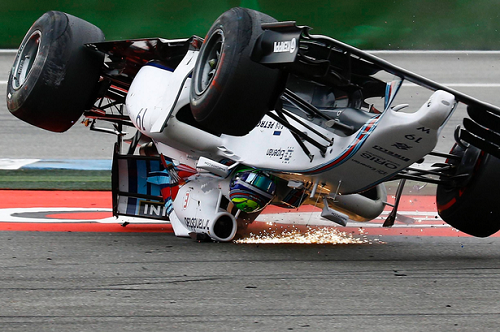 Fans and drivers alike who question the safety of those actions, and why no safety car was called when that is clearly a safety car moment have criticized this. All in all, I thoroughly enjoyed that race. As I said earlier, I was beginning to find the races becoming a bit formulaic, but I can only hope this new, closer racing continues next week in Hungary! Fail of the Day: No safety car period to aid with the removal of Sutil’s car. What were the FIA thinking?